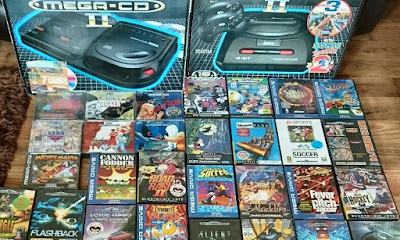 The compact mark 2 versions of both the Sega MegaDrive and the Sega Mega CD can be bought via this mouth-watering Mega Drive & Mega CD eBay auction. Both consoles come complete in their boxes with manuals, cables, controllers, and everything, and --most impressively-- are accompanied by 44 complete-in-box games. 8 on CD and 36 on cartridge. Among the games included you will find: Sonic CD, Final Fight CD, Night Trap, Sensible Soccer, Sonic 1, Sonic 2, Sonic 3, Streets of Rage 2, Castle of Illusion, Aladdin, Road Rash 2, Flashback, Lemmings, Cannon Fodder, Mortal Kombat 2, Alien 3, and NBA Jam TE.